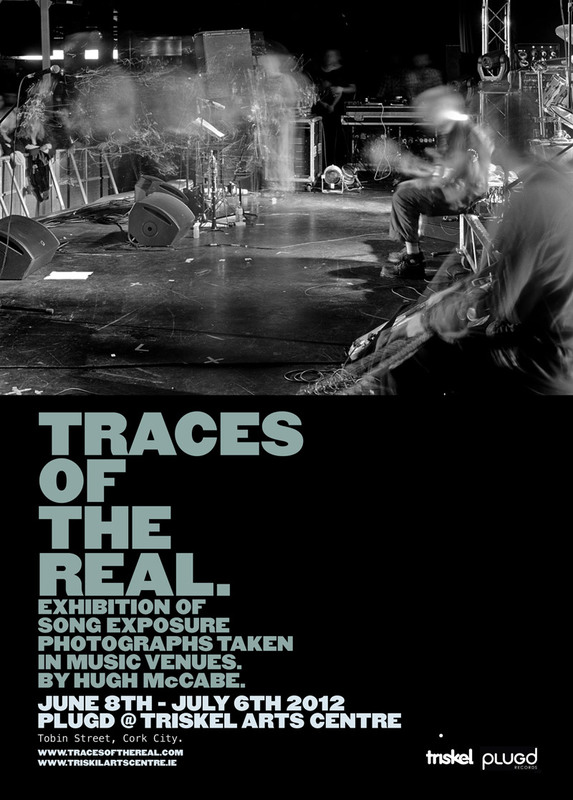 Last Thursday night saw the opening of the Traces Of The Real exhibition at the Fumbally Exchange in Dublin. I was really happy with the turnout and would like to say thanks to all who made the trip into town to check it out. Wine was drunk, pints were had afterwards, and I got lots of interesting feedback and opinions on what I have been doing. The exhibition runs all next week (Mon 18th – Thurs 21st April, 11AM – 5PM) so anyone who was not able to make the opening has until Thursday to catch it. 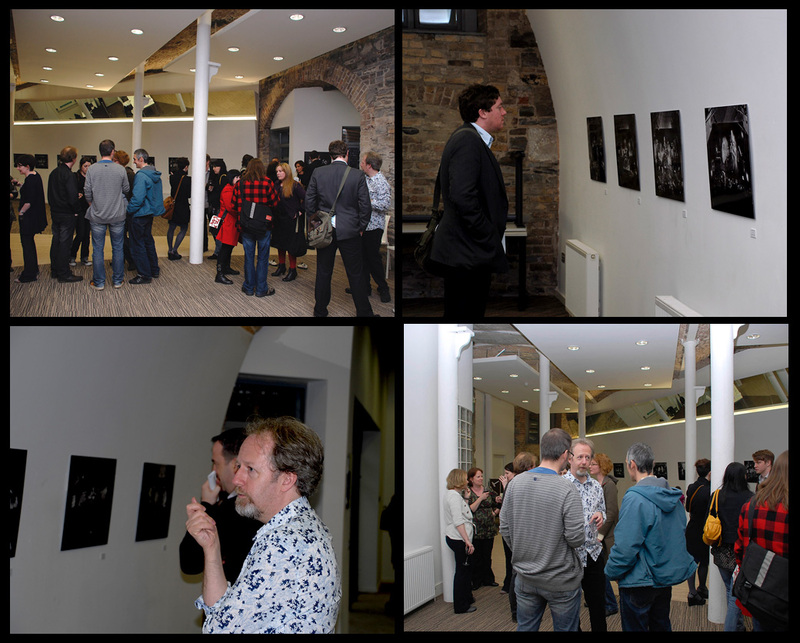 Several people on the night said to me that the experience of seeing the prints was completely different to seeing the images on the screen, as the printed versions reveal way more detail and texture than the low resolution screen versions can ever do. So, I think it’s well worth trying to come down to the show. I have been lucky enough to get some good media coverage within the last week or so. First off, I spent last Monday evening in the company of Richie Beirne from RTE Radio 1’s Arena arts programme. Richie interviewed me at home before heading in to Whelans with me where I was taking photographs at a gig by Italian reggae band, Africa Unite. He compiled a really good piece which was broadcast to the nation on Tuesday night. You can listen back to it by clicking on the link below (you will need RealPlayer installed for it to work). A couple of weeks ago, Nay McCardle of the Harmless Noise blog came along to Vicar Street with me, where we did an interview. It was published on the music website Thumped last week and you can have a read of it by going here. 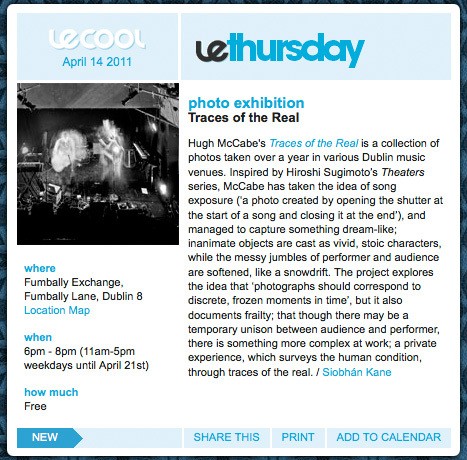 Finally, Siobhán Kane of Young Hearts Run Free wrote the following really nice piece for Le Cool. Big thanks to everyone who helped me make this thing happen and helped spread the word about it – Frank Brennan, David Monahan, Leagues O’Toole, Alastair Foley, Bren Berry, Declan Forde, Timo, Anthony Mackey, Nay, Richie, Siobhan, Dan Oggly, Artur Sikora, Dylan, Monika, Sharon, Fran, and in particular Fionnuala and Selwyn at the Fumbally Exchange. Facebookers, bloggers and tweeters – all plugs this week are greatly appreciated!